Looking for a Top Notch Genealogist? You're barking up the right tree! Interested in your Family History? I have been doing genealogy on my own family for 27 years. I have over 2,600+ names with supporting documents on my family alone. I have started my business in 1994. In 1997 I received my accreditation in genealogy by The International Commission for the Accreditation of Professional Genealogist (ICAPGen). Have you reached an impasse with your own genealogy research? 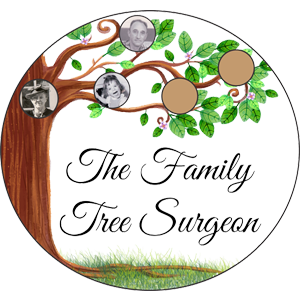 Let Debbe Hagner, A.G., the Family Tree Surgeon, do your genealogy research! We provide you a high quality computer printout of Pedigree Charts & Family Group Sheets. We can also provide the reports from different genealogical software packages as well as a copy of all supported documents. Debbe has presented lectures and seminars to a variety of groups in various settings. Her presentations include lectures and workshops for national, regional, and state venues using hands-on genealogical research. We provide Preparation and submission of documents for the Pioneer Program (depends on states and county, the United Daughters of the Confederacy (UDC), and other groups. Items are in best quality as possible and of varies format. As an experienced genealogist, expect all of your reports to be proficient in the art of writing a proper genealogical research report. We understand that our clients also expect professionalism, therefore we always provide detailed research. We also specialize in services for the Deaf and Hard of Hearing: TTY/TTD/VP and fluent in sign language. Debbe Hagner, A.G. earned an Associate of Applied Science Degree (with honors) in business technology. She attended the Rochester (NY) Institute of Technology where she graduated in 1981 and was awarded a Bachelors of Technology from the College of Applied Science and Technology. Debbe later went to Marist College (NY) where she accumulated 32 graduate credits towards a Masters Degree in information Systems. Her educational achievement led to a business career with IBM where Debbe was employed as a System Test Analyst. An amateur-interest in tracing her family's roots led Debbe to purse a professional career in genealogy. In 1996, she attended Brigham Young University and received a Diploma in family History, making her one of the few accredited, professional genealogist in the Tampa Bay Area. Debbe's private practice features special genealogy seminars and workshops on an on-going basis She also conducts private and confidential family background research studies and assists individuals on a one-on one basis to research family histories and develop supporting genealogy records. Debbe has served as President of the West Pasco County Genealogical society for several years and is currently a member for the Florida Chapter of the Association of Professional Genealogists. Give us the opportunity to retrieve information from databases and create the family tree print you've been waiting for. Providing you manuscripts that are prepared in various formats that fit your needs. Always from proven research that has been carefully summarized. Get expressive and biographical research and reports that illustrate comprehensive journals detailing all avenues while pursuing our entire process. A PINKY PROMISE WE NEVER BREAK! DISCLAIMER: In genealogy there are "no guarantees". We may find that no records exist for the person, place, or event you are looking for. Just be assured that we will give your request full attention and if the record is out there, we will do our best to find it! It's not just a gathering of items that carry a certain name - each block of research will be documented with our detailed Research Report! DISCLAIMER: In genealogy there are "no guarantees". We may find that no records exist for the person, place, or event you are looking for. Just be assured that we will give your request full attention and if the record is out there, we will do our best to find it! © 2019 Family Tree Surgeon Accredited Genealogist.